Many familiar with this band it will come as no surprise the new single released today is yet another banger!! 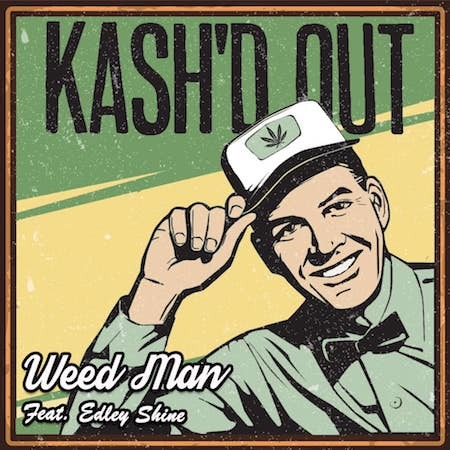 Kash'd Out have released their new single "Weed Man feat. Edley Shine". Now for those unfamiliar with Edley Shine you are in need of a history lesson and should pick up some old school Born Jamerican albums ASAP. Classic albums Kids From Foreign & Yardcore were on constant rotation in my collection in the mid to late 90s. For Kash'd Out to feature such a talent only meant one thing when I heard he was on this track, "It is gonna be good!!" Kash'd Out has really been on fire lately with a recent opening slot on the Expendables recent Winter Tour with Ballyhoo! If this is your first time hearing about the band please check out our Get To Know page with them by clicking here. This Law Records band has been putting out hit after hit lately including recent single releases On+Off, Give Back, and Good at Gettin' By. The new track continues the trend of songs that nails it on every level. Greg Sheilds is a straight champion at the art of a chorus. But rather than hearing me ramble on about how much I love the track just do yourelf a favor and hear it for yourself now below. Oh and always support the bands by purchasing the music and you can do so for Weed Man by clicking here.